�Mother! Mother! Come quick! The big fish ATE Streak�s hand!� Young Spider came shrieking up from the riverside, looking half drowned and with a face that was splattered with mud and blood. Ambergold reached out and touched the boy�s filthy cheek, checking with a pulse of her healing touch to ensure that the blood on her youngest�s face was not his own. Bow in hand, she then ran for the riverside, needing no more guide than the shouts and splashing she heard. It was bedlam on the riverside. A big sawtooth lay beached on the rocky shore, thrashing and trying to get back into the water. 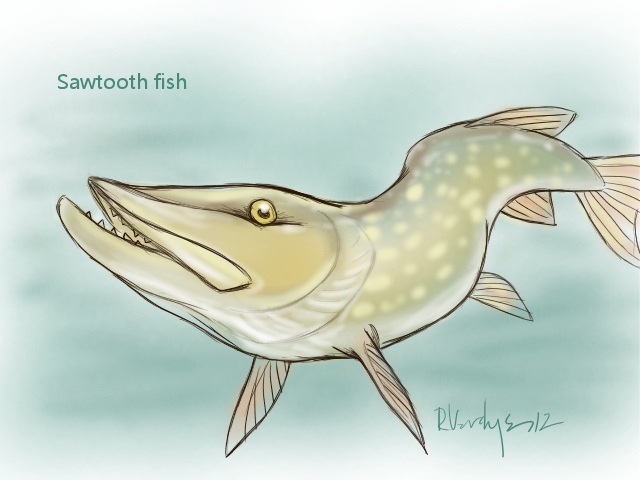 The fish looked as long as Strongback was tall -- it was hard to tell exactly, since the fish was thrashing and stout young Strongback was moving around as well, trying to hammer the sawtooth into submission with a big rock. Streak sat half in the river itself, cradling a bloody hand against his chest, while Fishberry stood on a log that was being battering by the sawtooth�s tail. The girl held a broken net in her arms and Ambergold couldn�t tell if the young fisher were laughing or crying. Ambergold skidded down the steep riverbank and took careful aim. The big sawtooth�s nearest eye seemed to stare back at her balefully. She released her arrow and sank it exactly as aimed, straight through the old fish�s eye. Its thrashing about began to slow considerably. Ambergold threw Raft�s daughter the look those words deserved, and moved to cautiously pry the end of her bow into the sawtooth�s toothy maw. With its dying strength, the big fish bit down, splintering the wood of the bow but not breaking it. Ambergold waited until the fierce jaws sluggishly relaxed before she waved at Strongback to come and help her in the recovery effort.